Trojans News · Feb 18 DeLuca & Cymmerman Win WPIAL Gold! Baker, Sabedra, Weinell also Represent Trojans on Podium! 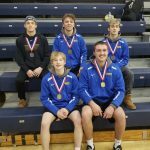 Two Derry Area seniors reached career milestones while competing at the WPIAL AA Individual Wrestling Championships this weekend. 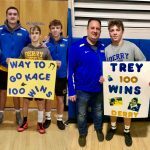 Kace Sabedra and Trey Weinell both joined the 100 win club! The club features phenomenal Derry Area wrestlers such as Jimmy Gulibon (Penn State) and Micky Phillippi (Pitt)! Congratulations! 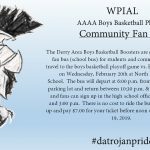 Trojans News · Feb 15 Boys Basketball Community Fan Bus! 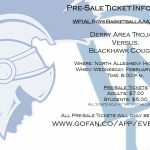 Pre-Sale Ticket Information WPIAL Boys Basketball AAAA Playoffs Derry Area Trojans Versus. Blackhawk Cougars Where: North Allegheny High School When: Wednesday, February 20, 2019 Time: 8:00 p.m. Pre-Sale Tickets Adults: $7.00 Students: $5.00 All tickets sold at the gate will be $7.00 Pre-Sale Tickets will only be sold online at this link.